At present we are looking at increased life expectancies and prolonged periods of employment. The aged workforce as a natural result of this phenomenon presents society with great challenges. At the 2nd International Symposium on Work Ability held in Verona, Italy between 18 and 20 October 2004 this problem was scientifically addressed. 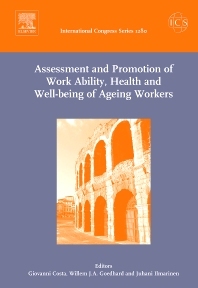 This book Assessment and Promotion of Work Ability, Health and Well-being of Ageing Workers contains the majority of papers presented here. The book reflects the major themes of the meeting which are factors affecting work ability and employability of ageing workers, assessment of work ability in different occupations, Evaluation of work-related problems of ageing workers and promotion of health and work ability. You will find very useful information and examples of methods, research and ongoing interventions.